On March 22, 2016, Tomo was working a construction job at 28 West 33rd Street in New York City when he fell 15 feet from a scaffold. As a result of the fall, Tomo sustained injuries to his left knee. The employer did not provide a safe, secured and/or maintained scaffold to ensure proper protection for Tomo. By failing to do so, the scaffold became unstable and tipped over. After his fall, Tomo was in shock while other nearby workers came to his aide. A private doctor saw Tomo on the day of the accident, where he was treated and released. Further examination revealed a left knee complex tear of the lateral meniscus and extensive synovitis (tear of his MCL). The injuries to the left knee required pain management injections. He then underwent arthroscopic surgery, which greatly improved the condition of his knee. Tomo also received physical therapy for over four weeks. Due to his injury, Tomo was confined to his bed for 3 weeks and was unable to work for a long period of time after the accident. Since Tomo was injured while working, he was entitled to workers’ compensation. In New York, workers’ compensation is designed to help pay for medical care and lost wages due to a work-related injury or illness. Thanks to his wife’s recommendation, Tomo reached out to The Case Handler team for legal guidance! At first Tomo was hesitant to bring legal action against the company he worked for and he did not want to start a case at all. He soon realized the overall cost of the accident would be too expensive to handle alone…so he decided to hire The Case Handler team at Pollack, Pollack, Isaac & DeCicco, LLP. 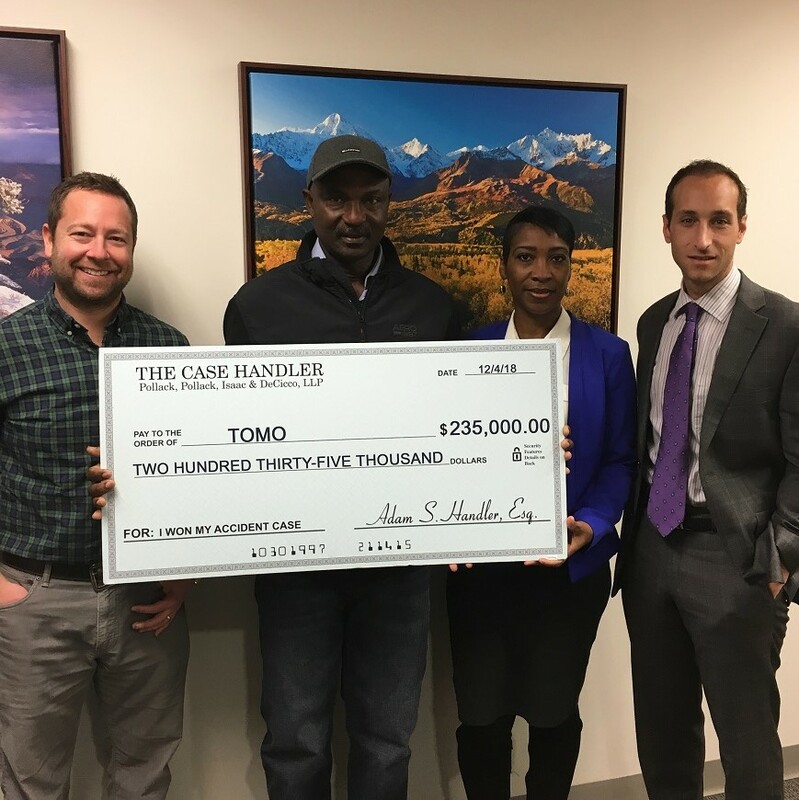 With the help of The Case Handler team, Tomo received fair compensation for his injuries and lost wages in the amount of $235,000.00!